*If he gets inspired, and Capcom approves funding, things can happen very quickly. Fixed. I'm sure Inafking would have made it by now if it was solely up to him and his genius. 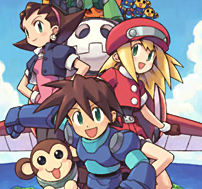 lol, what if they make an NES style Megaman Legends. Holy cow, how pissed would be people be? Time for an inspiration sensation! only time will tell people.